Shockingly, it was the border around the porch floor that created the most enduring drama of the build, THE BORDER! Now the idea of a border around the deck is straightforward enough. It would dress up the edges, protect the end grain of the boards, and sit under the columns so that new flooring could be added without impacting anything structural. Perhaps most importantly it would dress up the huge expanse of boring deck boards, and bring them just a little bit of class. We considered doing it in 5/4 treated pine, ipe or cumuru (tropical hardwoods), and AZEK. A huge area, especially when measured in tiny toddler feet. The pine was a no go for obvious reasons, we wanted to avoid having to replace it (preferably forever), not to mention it's prone to cupping and splitting. The ipe and cumuru are beautiful, but they are notorious for not holding paint well (i.e. if they started to fail we wouldn't be able to paint them to extend their life), and they're prone to splitting in dry weather. 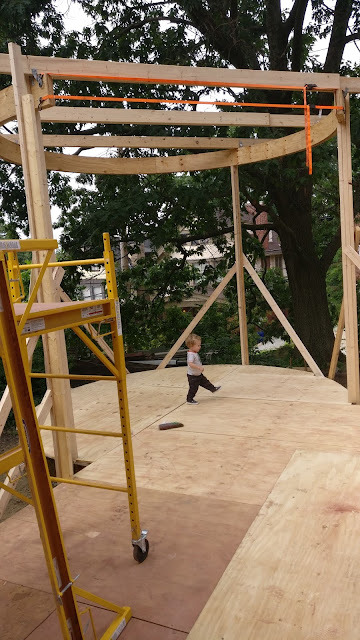 Additionally, the widths and lengths we'd need to cut to build up the curve of the gazebo would add considerably to the price, and have left us with many seams. This left AZEK. I'm as wary as anyone about putting plastic on an old house, but there are times when it's a life saver. In the case of this porch it will make up the border, and parts of the fascia and skirting on the gazebo. Now, one of the greatest things about AZEK is that it bends, and AZEK makes a special heating blanket just for this purpose. Could I find one to rent or borrow anywhere on the planet? No, and I called EVERYWHERE... Luckily I had the brains to call corporate, and they put me in touch with the western PA rep. He had a blanket. He came out to bend the boards for us. FOR FREE. The deck boards were left long and cut down with a track saw on the straight sides, and a router on the gazebo. The AZEK trim was bent around the curve so that it matched the radius perfectly. 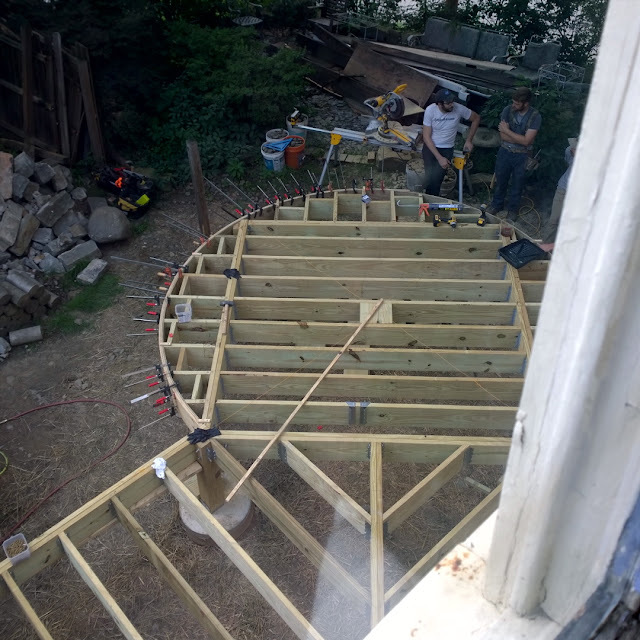 While this was happening the temporary porch supports were cut and supported as each piece was installed. No one's quite sure how the section facing the stairs will fair with frequent foot traffic, so we made sure that section can be removed and replaced if it becomes an issue in the future. Specifications for the lumber and deck stain we're planning to use recommend waiting a year before finishing, so I guess we're done with the deck until summer. Happy birthday, Toren. Merry Christmas to everyone! We'll most likely use Azek for the cornice and all the curved bits, but I got a little spooked from doing more than that when someone reminded me that the AZEK won't deteriorate if there's a roof leak, potentially allowing a lot more damage to occur before someone notices it (eek!). Merry Christmas, and give Petal a kiss on that long beautiful nose for me! That porch is such a lot of work! I am impressed with the thought and labor involved. Looks solid! I never hesitate using high-tech materials on my 1894 house...as long as they look 1894 when finished! Cannot wait to see the finished decking images!!!!!!!!! I don't know, I wouldn't mind one or two of your decidedly non-1894 looking boilers! I love you but you cannot have any of my boilers! Super option, I did not even know it. Thanks, I will know for the future.What a right that is right! Well, you described it, I like it!